Improving your vision can be a life-changing experience. 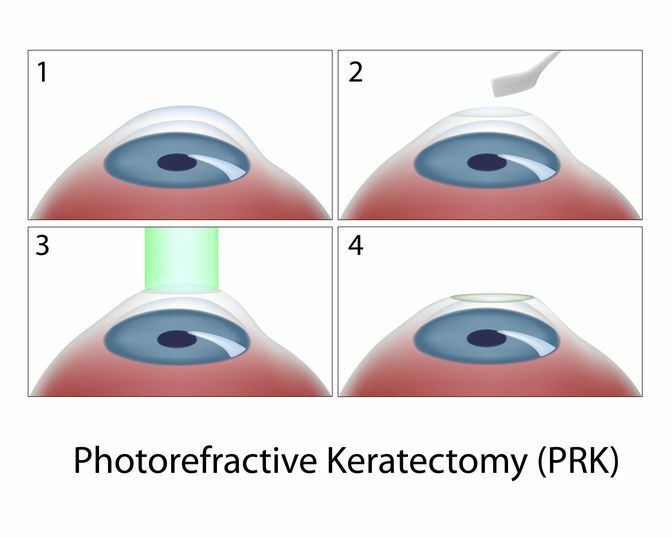 PRK, or photorefractive keratectomy, is one of several laser eye surgeries we offer at Southwest Eyecare & Laser in Bakersfield, CA. This minimally invasive procedure is often performed as an alternative to LASIK. We strive to provide the best care to our clients by pairing our team's vast knowledge and experience with the latest technology available. Dr. Gregory A. Stainer is highly trained in laser procedures and has dedicated his career to providing his patients with leading vision correction services. Our team can evaluate your eye condition to determine if PRK is the right treatment for you. Unlike LASIK, PRK is performed on the outer surface of the cornea and does not require a flap to be created. Instead, the laser is strictly used to reshape the surface of the cornea. PRK is performed using advanced laser technology to reshape the cornea. At our practice, we use the Allegretto Wave™ Eye-Q Excimer Laser System for this treatment. This advanced laser uses a high-speed tracking technology for a more expedient and comfortable surgery that reduces the need for anesthesia. However, if desired, anesthetic drops or an oral sedative may be used during the procedure to ensure your comfort. Dr. Gregory A. Stainer is highly trained in laser procedures and has dedicated his career to providing his patients with leading vision correction services. To begin your procedure, Dr. Stainer will gently remove your cornea's outer layer (epithelium). The laser will deliver pulses of cool ultraviolet light which can remove a thin layer, reshaping the curvature of your cornea. The depth of cornea removal is based on the amount of correction needed. Once the laser portion of your treatment is complete, Dr. Stainer will cover the treated area with a specialized contact lens to protect your eye while the outer layer of your cornea heals. Following your laser eye surgery, you will be provided with medication to manage any discomfort and aid in the healing process. You may experience some swelling and sensitivity while the outer layer of the cornea heals. Most patients are able to return to regular daily activities, such as driving a car, within one to three weeks. However, it can take up to six months for your vision to fully stabilize and improve. We will regularly monitor your recovery to ensure optimal results. Dr. Stainer has helped countless patients improve their vision with PRK. He is committed to creating personalized treatment for each patient and will help you determine the best course of action for your vision correction needs. If you would like to learn more about PRK, contact us online or call us at (661) 833-4040 to schedule a complimentary consultation.